Last week I wrote about the role of women in the Mahabharata. Today I'd like to go a bit deeper into that theme--and discuss Draupadi. For those new to the story, some information: Draupadi is not born as other mortals. She is the result of the overwhelming desire of her father, the King Drupada, to have a daughter to marry the hero Arjuna. He undergoes a strict penance in order to do this, and one day he is rewarded: at the culminating religious ceremony, a glorious woman, surpassing all others in beauty and character, steps out of the sacrificial fire, along with her brother, Drishtaumnya. They are the fire-born twins, superior in every way. 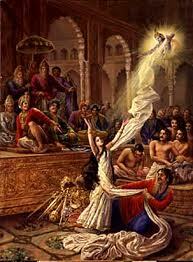 In the traditional Mahabharata story, Draupadi is "born" as an adult woman. In the Palace of Illusions, she is born as a child, and goes on to reject her given name, Draupadi, meaning daughter of Drupada, in favour of the name Panchali, meaning, from the kingdom of Panchala. And it is that first act of assertion, rebellion even, that determines the rest of Panchali's actions throughout the novel. Throughout the ages, in Hindu society Draupadi's portrayal is mostly negative – few girls are named after her in India, for she is regarded as responsible for the downfall of the Kuru clan, the chief instigator for the cataclysmic war that ends it all. For the Indian concept of ideal femininity she is too headstrong, too dominating, too independent. And of course, it is exactly these qualities which will endear her to modern Western women. Divakaruni gives her a powerful voice, one that places her as an equal alongside the men at her side. Though she is pledged, without choice, to five husbands, and must rotate among them spending a year as dutiful wife to each one in turn, within this role she asserts herself and there is no doubt that she will not be pushed around. Although I enjoyed the book as a whole, and found myself identifying completely with Draupadi while reading it, I do have some quibbles. I didn't quite see eye to eye with Divakaruni's attempt to give Draupadi the soul of a modern feminist, railing against her destiny as wife to five husbands, mother of their children. I believe that the sense of Dharma would have been so fully ingrained into her soul she would not have once questioned that role; from the perspective of a Hindu, adhering to Dharma is strength, not weakness. But this is Divakarauni's book, her vision, her Draupadi, and I accept it. The book is simply too good. 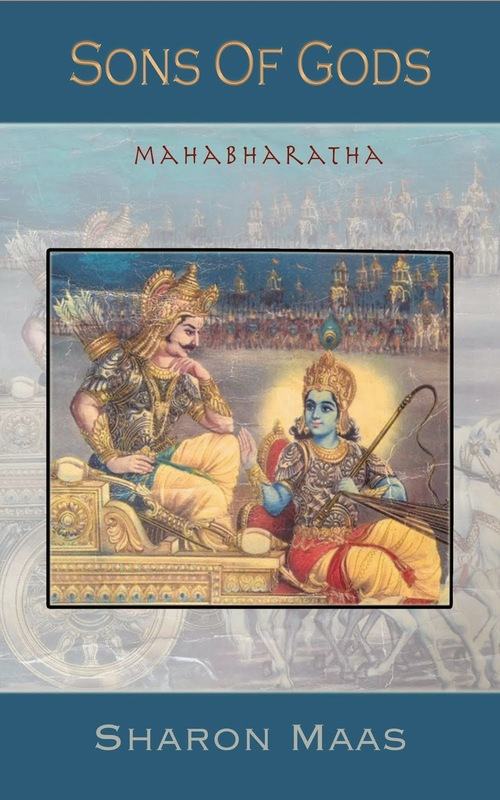 Divakaruni wrote the entire Mahabharata from the point of view of a single character, which of course means firstly, that the point of view of that character is biased, and secondly, that the reader only gets to see those scenes in which that character is present; everything else is by definition only hearsay, reported by the narrator or by the other characters, and by necessity much condensed, and I often wondered, while reading Palace of Illusions, how well a reader unfamiliar with the Mahabharata story would really understand what is going on. As it was, I was astonished and delighted to see how well it complements Sons of Gods. "Karna is my favourite character. In many shorter versions of the Mahabharata his role is skimmed over; he is merely one of the antagonists, Duryodhana’s right-hand man, Arjuna’s arch-enemy, a villain. And in the longer versions the reader tends to lose sight of him; he is lost amid the sheer vastness of the epic. But I’ve always been on the side of the underdog, and I love the fact that Karna in the role of the underdog actually possesses a secret power, a power he is unaware of. His position is pivotal to the entire story, and I was determined to make this clear. That’s why I brought forward the scene of his conception and began the story with that, as a sort of prologue. It’s to say: watch this guy. He’s important. Don’t forget him. He’s a great character. Flawed, but honourable to his fingertips." Divakaruni obviously sees Karna in the very light that I did, because, in her book Karna is a main character. It’s not a spoiler to say that Palace of Illusions is about Draupadi’s secret love for Karna, because that is the hook of the entire story: and what a Karna we have here! He is just as I imagined him: a truly noble hero, the greatest of them all, whose only flaw is a result of the tragic circumstances of his birth. And so it is Karna in particular who links these two books: Sons of Gods, that tells the whole story of his life and death, and Palace of Illusions, that tells the story of the woman who loved him most. and I have to thank Divakaruni for opening up the character of Draupadi and making her a living, breathing character with her own story to tell. The Palace of Illusions is available through Amazon and at all good booksellers.